"Dad, can we go driving tomorrow?" "Dad, can we go driving tomorrow?" read the text message from a number I did not immediately recognize. 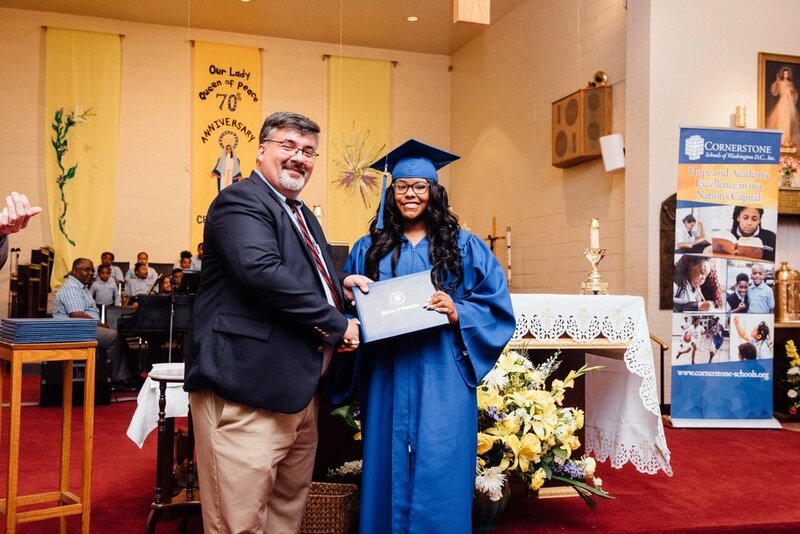 It had come from Lynette, a recent Cornerstone graduate. When emails and texts from students start with, "Dad," that usually means I am about to be asked for a big favor. They know that being called "Dad" melts me and makes me want to live up to that important name, especially for students who lack that role at home. Many of our students come from homes that do not have a car or where no one drives. When asked, I have often told students that I would teach them to drive in my car. Most ask, I theorize, to test how much I am willing to do for them. Fortunately, no one had ever taken me up on the offer, until this text from Lynette. I agreed to take her driving the next day, hoping Lynette would forget or chicken out sometime before our scheduled driving lesson, but no such luck. The next day, thirty minutes early, with the biggest smile I have ever seen, Lynette was ready for our drive. We spent twenty minutes driving around the parking lot of a skating rink across the street from the school in my yet undented Kia Optima. We practiced right turns, left turns, starts, stops, parking from the left, then from the right. We practiced aligning ourselves to the right of the driving path. The entire time, my student driver had a smile on her face that stretched from the passenger door to the driver's. Then, I turned and said, "let's hit the street." I pointed to the exit of the parking lot and the relatively busy road beyond. Suddenly, Lynette's smile disappeared. "Ummm...sure...do you think I am ready?" Within seconds, we were off, cruising Southeast D.C. in my Kia. We stayed on back roads around the school until we accidentally ended up on Southern Avenue and then Benning Road -- two of the main thoroughfares in our neighborhood. I would be lying if I said I didn't have a few panicked moments or grab the wheel a time or two. We had a few close calls and lots of "learning moments." After the hour lesson, parked safely in front of her apartment, I filled in her driver log, checking off each skill she had practiced. Her confidence now booming...her smile returned. Lynette noted her arms and legs were sore. I laughed and told her my whole body was sore. If you have taught someone to drive, you will understand why. As she got out of my car, thanking me profusely, I thought about how this hour of driving was a metaphor for Cornerstone. For the short time students are in our school, we instruct them in basic life skills, hoping to prepare them for the real world outside our safe, controlled environment. Then, upon graduation, we release them onto the chaotic, dangerous streets. Our students will be subjected to a lot of unknowns, they will feel lost, they will suffer impatient gestures and honking, and may find themselves in situations where they will have to draw deep from the lessons they learned at Cornerstone and turn, prayerfully, to the wisdom and power of God who is riding shotgun, ready to grab the wheel at a moment's notice. As I drove away, on some of the same streets Lynette had just covered, I thought about how much harder it is to learn to drive in the city. No deserted country roads, no wide routes with limited traffic, and no streets without parked cars. Our Cornerstone students will face many things in life that are just harder than we faced growing up, and will require more grit to face these heightened risks. I am so thankful that Cornerstone is filled with staff who are willing to confront those obstacles with our students and to petition our Creator's guidance for our students as they maneuver the world before them. God, we ask you to vigilantly drive with our Cornerstone students as they navigate this world and fulfill the great plans you have for their lives. "Thank you for changing my life"